AI is the new content marketing. It’s no longer the faceless Hollywood science-fiction movie character it was in the 90’s. It’s helping companies crunch data at an unprecedented speed and deliver highly personalized content to their customers. From Netflix to Starbucks to Google Search, consumers are increasingly getting accustomed to sophisticated experience, all thanks to the AI technology. Whether you’re a small start-up or a Fortune 500 enterprise, you can boost your productivity using one of the AI tools out there. It’s hard to imagine any B2B content marketer who is not really familiar with this emerging technology. But, for those unfamiliar with this trend, here’s how to get started with the AI. One of the smartest ways to start a content marketing campaign is to build a content calendar. In fact, according to B2B Content Marketing Trends 2017, 62% content marketers believe editorial calendars are the third most effective content marketing tools after Analytics Tools (79%) and Dedicated Email Platforms (64%). So when should you plan your content calendar? Summer says ideally you should plan your content a month in advance. It, indeed, allows you to take stock of your existing content catalog and capture ideas for your future content creation strategy. However, the most daunting task of creating a content calendar is crunching user data and predict what content your audience will find valuable and engage with. In 2015, a study by Buzzsumo revealed 50% of the content published gets fewer than 8 shares while 75% of the published content gets “zero links”. You don’t want to be in the 8-shares-or-less bracket, do you? So, how do you deal with the challenge of analyzing user data and ideate content for your audience? The answer is by using Predictive Analytics. Predictive Analytics, being a powerful AI tool, predicts customer sentiments, intent and behaviors. When you know what your customers are asking, you can create resonating content and gain a competitive advantage as well. There are many predictive analytics platforms that help you at various stages of your content planning process. Trendspottr: This AI-driven analytics platform captures large data streams from across social media platforms, and reveal emerging trends and viral content for content marketers. Idio: You may have hundreds (or even thousands) of content pieces in your content catalog but only a few generate the tractions for your campaign. This intuitive platform examines your existing content and shows you the winners that drive qualified leads. Moreover, it shows the content gaps and hidden opportunities, helping you discover content pieces that can boost your ROI. Once you’re done planning your content, it’s time to actually create the content. The volume of content you need for your campaign will differ based on the size and number of campaigns you’re running. If you have a team of human content creators, you will need to automate a few tasks that are more repetitive and less creative. Employing AI can save your organization countless hours it’d take for human writers to generate a large volume of data-driven content such as financial statements to sports recaps. In fact, many businesses have already started using AI to generate content. Using Wordsmith, Automated Insights, help companies generate 1.5 billion narratives annually, thanks to Natural Language Generation (NLG). Similarly, after using Wordsmith, The Associated Press increased its stories on corporate earnings reports by 12 times. Apart from Automated Insights, Quill is another popular NLG platform that’s leading in AI-generated content. It’s helping companies create simple news stories, reports and headlines that require little human intervention. Our Atomic AI platform helps our customers identify actionable data patterns, suggest content readability improvements, and measure performance in real-time. Even at such an early stage, the AI-driven content creation platforms are helping companies save time and boost productivity. Predictably, the NLG platforms will become mainstream in the near future. 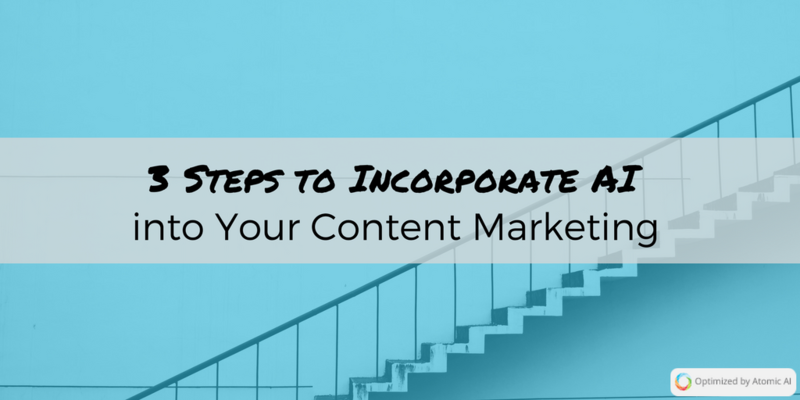 The most crucial piece of the content marketing puzzle is the promotion. Even a great piece of content will generate little traction unless it’s promoted to the right audience at the right time. Knowing the right audience and the right time is, indeed, the most perplexing task of content promotion. It requires understanding your niche audience, gauging their sentiments, analyzing social media usage patterns and so on. Surely, it’s very difficult (and massively time-consuming) to conduct this process manually. Luckily, many AI tools have emerged to help you out with this exasperating process. Cortex: This intuitive platform offers actionable insights to boost your engagement. It suggests keywords, hashtags, images, and colors that are more likely to prompt your audience to engage with your content. Moreover, it schedules your posts at a date and time that’s suitable for your audience to consume your content, resulting in a higher outreach. Rival IQ: Content marketers relying on Twitter for engagement and outreach always look for the right hashtags to target their niche audience. Rival IQ helps save a great deal of time by delivering critical insights with their hashtags analytics. By revealing the performance of your hashtags and those of your competitors, it makes you data-aware in real-time. Autonomous Media Buying: This AI-powered tool developed by Albert.ai takes the guesswork out of media buying. Driven by natural language processing and machine learning, this platform detects patterns, draw conclusions and adjusts performances as it goes. From predictive analytics to natural language generation, AI tools are increasingly becoming an integral part of everyday content marketing campaigns. In other words, incorporating AI into your content marketing scheme is no a choice anymore — it’s imperative.